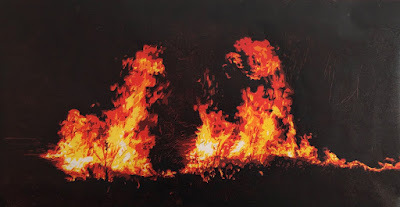 January 28–February 9: 'Burning Weeds', a hand printed, five-color lino cut, 24 x 12 inches. At this stage neither the logistics of printing and binding or the format of the book have been resolved, but a page size of 10 x 12 inches (landscape) would accommodate this image as a double-page spread if trimmed to bleed. Red, on orange on yellow, and orange on yellow, 'wet on wet ink' proofs. 'Wheat Field', early morning, lino cut with watercolor wash, 24 x 12 inches. These double-page spreads convey the breadth of the landscape but printing them presents a challenge. Perhaps single-page images would make more sense . . . .
How about 12 x 7.5 inches? Here a close-up of the key block for a three-color lino cut, 'Cultivating' with the Massey Ferguson tractor. This print of the key block is offset onto two other blocks, one each for red and green. 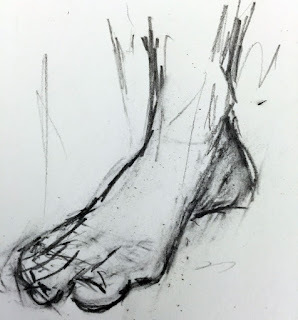 January 12, 2015: Making adobe clay involves 'puddling' – the mixing of clay, sand and water with your feet, hence this pencil study. Drawing is an important discipline for the artist – daily practice is worthwhile. This post includes detailed studies as well as sketches for the illustrations to the Pizza book. One of the main goals is to grow wheat for flour to make dough for the pizza. Here is a pencil drawing of an ear of Glenn organic Spring wheat grown on our farm here in Iowa. The first step in preparing the field for planting was to burn last years weeds, with the hope that many of the weed seeds were also incinerated. At this point I began to think the book should be landscape format and this subject will become a double page spread lino cut.